I love my car. James loves his car. I have had my car since 2006 and she's been paid off since 2011. I seriously have a strong attachment to my car. I can't even imagine life without her. Yep, it's a her! We make it a special effort to keep our cars clean and well maintained at all times. Sometimes this means doing it ourselves. Taking care of your car gives you a sense of pride and accomplishment and it's beneficial to both the car and the driver. Here are a few ways to give your car the TLC it needs. Washing the exterior of your car and properly waxing it can help maintain the life of your paint. I've seen cars that were never washed or waxed and they have cracked and peeling hoods and bumpers. If you don't want to do it yourself you can always go to a drive through car wash or take it to an auto detailing service. Your tires will need rotated from time to time and in order to prevent flats you want to make sure your tires have the right amount of air in them. I make a note on my calendar every month to check the air levels. If you don't have a gauge at your own home you can always stop at a gas station that has one. If your tires are low you can fill them up easily. And if you don't know the level of air for your tires check your owner's manual or sometimes the inside of your driver's side door has a sticker on it that gives you that information. And if all else fails you can call your local dealership to ask. I see so many people that let the interior of their car, especially the backseats become a dumping ground for trash. I keep a little trash bag in the front and I keep my car spotless on the inside. If you always have things on the floor it could lead to a spill or a leak that could stain the interior. I also keep the interior vacuumed and I wipe down the dash. No one wants a car full of dust right? I can't stress enough how crucial the oil in your car is and how it can prolong the life of your vehicle. 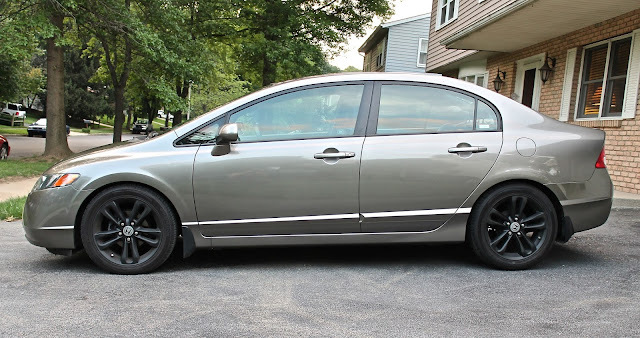 I use Pennzoil Platinum Full Synthetic motor oil on my Honda Civic. Pennzoil Platinum motor oil gives you a better fuel economy and on average you can get an extra 550 miles per year. You can also get excellent performance in extreme temperatures because this motor oil provides faster low temperature oil flow and protects in extreme heat. And did you know that this motor oil can even keep your pistons up to 40% cleaner than the toughest industry standards. 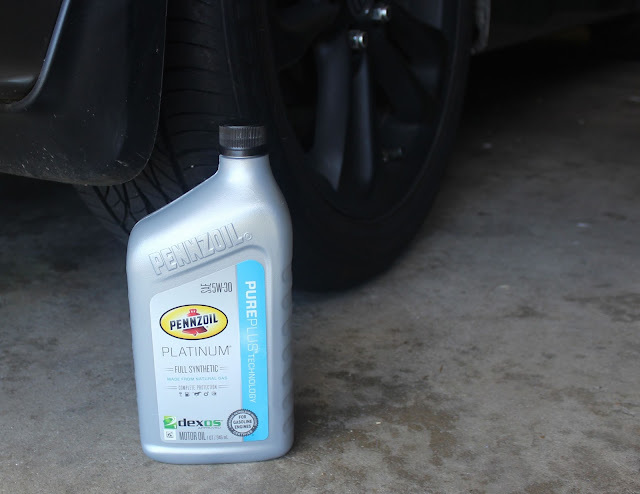 There are so many benefits to Pennzoil Platinum Full Synthetic Motor Oil and it really does give my engine complete protection. You can always have a professional change your oil but I do mine myself with the help of James of course (a lot of help - wink wink). Here's a quick tutorial on how to change oil based on how I change mine. Please use standard safety procedures when changing your oil. You should always refer to your own car's manual before changing your oil. 1. First things first you will need to make sure you are parked on a flat, level surface and your car is turned off. Make sure your parking brake is engaged. Some people like to put their vehicle up on a jack stand. 2. Pop your hood and find your Engine Oil Dipstick and remove it. 3. Locate your engine's oil pan which your owner's manual should show you the location of and find the oil drain plug. 4. Place an oil catch pan under the drain plug and loose the plug by using a 6-point socket or a box end wrench. Do this slowly so that when you remove the plug you can ensure the pan is underneath it. The oil will start to drain out and it may take a few minutes. 5. When it's finished draining, replace the oil drain plug and make sure it's tightened. Then locate the oil filter (once again if in doubt of anything check your owner's manual. Loosen the oil filter and make sure the catch pan is underneath to catch any oil that may drain out. Then remove your old filter and replace it with a new one. 6. 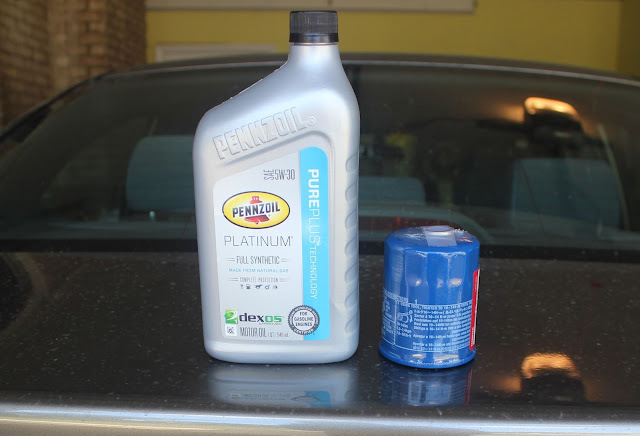 Now under your car's hood you will locate the oil fill can and pour in Pennzoil Platinum Full Synthetic Motor Oil. Depending on what the manual says you may have to use several bottles of it. Make sure you use a funnel because this can get messy. 7. Replace the oil fill cap and start your engine for about 30 seconds. Make sure you check that there are no leaks. Then shut the engine off again, put your dipstick back in to check to make sure you have the proper oil level and if you do then you are done! I found Pennzoil Platinum Full Synthetic Motor Oil at AutoZone. So tell me... does your car have a name? Do you adore yours as much as I love mine? So nice that your car is paid off. I think that would make me love it a little more. Ha! My hubby and I are adamant about keeping our cars in the most tip-top shape too! I mean, as much as we can with a messy little five year old boy! Haha. And we travel a ton…so it gets hard at times. But we wash them as often as we can, rotate our tires and keep the oil changed on time. We normally take it to a shop here in town for oil changes because it’s just fast and easy…but we really need to start doing it ourselves. Thanks for the tips! And yes…I’ve always called my car Betsy! Ha. oh yea it def makes me love mine more haha! a car is an investment so its def a good thing to always keep it in good shape! and oh my betsy - i love that! so cute! Having no car payments is SOOOO nice. 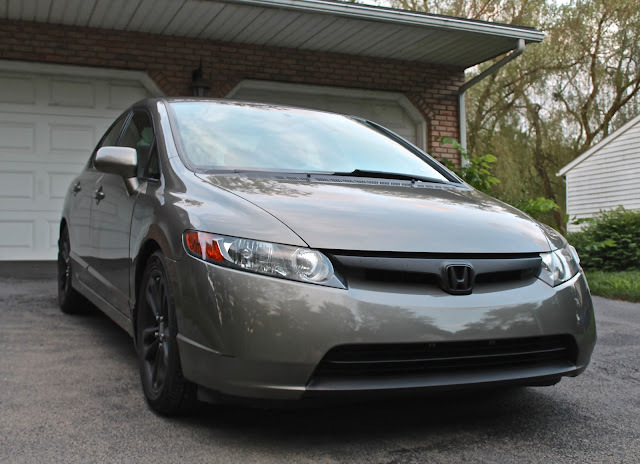 I need to get used to them again, because I should be getting my own Honda at the end the month/early November! yay! hondas are the best i swear! so reliable and they really hold their value! My car is in desperate need of a car wash and wax. But with my twins, it is so hard to get it done. And I wish I could do it myself, but the girls won't sit still long enough for that. Haha. maybe for christmas u can ask for a gift certificate to get your car detailed somewhere :) some places even come to your house to do it!